Pythia told me where Nenet was. He was in the last trap of the Craftsman. When the volcano ejected the ash cloud, the inner gates opened and Nenet was thrown from one volcano to another in a matter of seconds. That's why he lost track of where we were. My Emperor, I was too worried about Nenet's disappearance and neglected my duties to inform you about my findings. Now I need to report my latest discovery. Visiting Delphi helped me to solve one last mystery about those lands. While traveling here and there around the scattered map, I noticed that some regions are way more populated than others. At first, I thought that was due to the resources they offered or perhaps the special abilities associated with these lands. 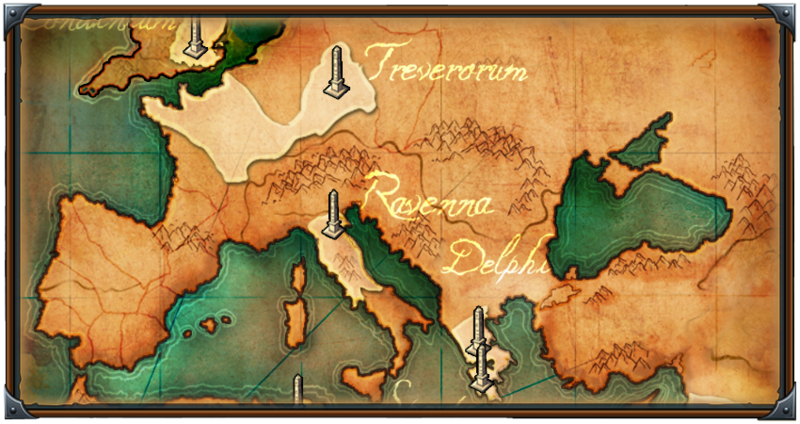 After traveling to Delphi, the region turned out not to provide any special abilities at all and yet it still had lots of villages all over the place. I recall that they hadn't even heard about our greatest buildings! Well, I finally found the answer to this mystery. It's not Wonders of the World that define who rules in these lands, but instead those who take control over the regions. People gather in alliances led by the most cunning masterminds to fight for supremacy. Many battles happen here every day as the people wrest for control over the regions. They came up with victory points to give value to each region. I decided to stay here and, now equipped with this knowledge, I'll observe this battle through to the end. When I was really close to the volcano in Brundisium, I noticed a familiar silhouette in the sky and heard a screech of joy. I lost one companion, but found two. My journey was over. Task: The winner in Path to Pandora is defined by the victory points that alliances earn on a daily basis. How many points in total can the world possibly produce each day if all regions are unlocked and controlled by an alliance? Hint: The number of artifacts and the number of regions match. Post was edited 1 time, last by Stellamini ( Mar 20th 2019 ). There are a total of 4200 points that can be produced in a day from all regions. The alliance can earn 4200 points each day. en de TS20 het dubbele, dus 8120 punten per dag. Ik verwacht niet dat er een extra bonus is voor het in meerderheid bezet hebben van alle regio's, want dat lijkt mij schier onmogelijk. I do believe the total possible VP that the world regions produce together, if owned by a single alliance, would be 4200 VP / day. 4200 is the maximum possible in 1 day.